Picking the right language for the task.. In the past year I had to juggle multiple programming languages much more intensively. While it helped me to improve my skills and refresh, I also came to some conclusions. Knowing to select a language for a task, knowing these languages and their capabilities is useful in RnD area as time and effort can be saved in writing the code and focus can be put to the actual research. Below views are my personal opinions based on past experience. They might not be the most correct. IDE support can be sometimes bit annoying, esp. finding an open source one, they tend to hog memory or CPU. I use QT Creator, VS Code ( != visual studio**) and just plan text editors. After a long pause, I got back to using python. I paid more attention on code quality, learnt more of specific python3 matters. Quite nice for quick prototyping, etc. Can handle many things well. Specially scientific calculations, matrices, etc got excellent support with libraries such as Numpy and Scipy. In essence, it is entirely possible to use Python in place of Matlab and can be quite faster and of course free of charge. These libraries are good in performance too, thanks for nice support for calling C/ C++ API’s from python, computationally intensive algorithms can be written in C/C++ and wrap around Python. (C++ calling from Java was a nightmare in comparison). This same feature would be useful when providing Python API’s for C/C++ libraries or calling computationally intensive, optimized algorithms. I’m not very convinced of production-level code, probably better to convert to Java or C++ (or use a wrapper?) when bundling. These questions mainly arise when dealing with proprietary code that has to be deployed to customers. There is bytecode based distributing option like Java, but I don’t know much about options. Python definitely do better than JS for prototyping, esp. matrices, etc stuff. Alright for quick prototyping with NodeJS. Being a born-in-browser language, it’s support for web and related things, async programming is nice. However, for larger projects, consider writing in Typescript or similar typed language for better code quality and ease of debugging/ IDE support. I rather stupidly implemented a camera calibration tool on JS since the debug framework was NodeJS + browser, pretty much wrote everything including a bug-freed Levenberg Marquardt solver. Despite “write once, run anywhere”, C++ is preferable on some ends (with many FOSS libraries available in most platforms). Java can do pretty much everything like C/ C++, but that doesn’t mean it should be used for everything! However deploying in many platforms is easier with Java . Yet I don’t fully agree on “enterprise grade stuff is written in Java” story. I believe Java usage in Enterprise environments got accelerated with Sun certifications, hardware, the very nature of JVM and there are many mature tools written in Java. My disagreement comes because there are better tools out there for certain jobs but some people cannot do anything without Java which can become a bottleneck in RnD environments. Languages/ frameworks should be chosen for the task and situation, not by the fact the programmer or system architect is __ years experienced with Java based systems. This used to be my de facto choice for server side web apps, rendering, etc. WordPress, Joomla, etc are written on PHP! Decent looking and readable code can be written in PHP with good use of classes and using well made frameworks. In terms of web-servers, Java tend to be generally slower in this area, and PHP is optimized and pretty much made for this job. While it is possible to do pretty much everything from all these languages, it should be noted that all of these languages are written in C/ C++ in general – why? performance. But that doesn’t mean everything should be written in C/ C++. Some people like to write everything in Java, C/C++ or Python, what I wanted to point out in this rather entangled and not-so verbose post is that tools are there for convenience and to get the job done!! I wanted to build or find a low cost setup a few years back, but the search was quite useless 😛 . Building one need sensitive components and finding these specialized components in Sri Lanka is almost impossible, so I gave up. At the present, there is one or two low cost products like LIDAR lite ($150) approx. with max range of 40m. There was another kickstarter project as well, similar pricing. For the first stage, I’ll simply experiment with available research, low cost components. Later on, optics and range will be improved. Will use PIN photodiodes instead of commonly used APD (Avalanche Photo Diode) – cost and requirement of high voltage circuit for APD makes it unattractive. Attempt to use phase shift method and time of flight method. Light receiver and amplification circuit. This is probably the most crucial stage for a low cost setup due to the less sensitive PIN photodiodes. My first trial was using Osram SFH 4545 IR emitting diode and Everlight PD333-3C photodiode. I used a TI Tiva C launchpad to generate the needed pulse output and a BC337 transistor to drive the LED. This setup is not much ideal and I need to use a MOSFET to get good rise/ fall time and current output. (This LED can handle up to 1A pulse). I started with available components I had. Judging on the literature available, the needed circuit is called “trans impedance amplifier” – this simply mean the amplifier convert a current to a voltage. The reason was that photo diodes actually generate current than a voltage on different lights. After referring articles mainly by Texas Instruments, I constructed the following circuit. I did not do any formal calculation or analysis, this was just a trial and error setup. The Op amp I had at hand was TLC25L4A. This is a low power op amp with decent gain but the bandwidth is not that impressive. Nevertheless, the circuit was the foundation of the next iteration. Op amp : TLC25L4A, R2 = 3Mohm, CR1 = PD333-3C. Image from SBOA060 – TI application note. The circuit amplified signals picked up from the photodiode quite okay. But the range was severely limited. Measurements were taken from my 5 year old DSO Quad oscilloscope. The main issues I faced was the lack of optical filter on the photo diode, therefore it picked up 50Hz light came from the lights in my room, etc. Attempts for filters were rather futile (I tried RC filters only, didn’t have inductors at hand). At maximum range, approx 60cm!. The amplifier did not have a big gain. In the next installment, I’ll explore the next set of circuits and other changes such as IR pulse width, etc. This and the following posts will cover the areas about the file API that was not clearly covered in the Dreamfactory Documentation. The focus on this article is about file & folder creation. For all these requests, a JSON request body is used in the following basic format. POST : Each element of resource array will define a File, Folder request. 1.1 One or multiple files with JSON data. Note: Setting property “is_base64”: true will enable to upload images with “content” set as Base 64 encoded string. Warning: Using Base64 encoding for large images is highly discouraged!!! (I tried uploading 18MP image and it was not worth the trouble). For these cases, go for direct file upload by multi-part form. This will create two files in the folder names “folder2”. If the folder does not exist, an error will occur. When I tried to upload some big images, base 64 encoding was not good for the performance at any level. Therefore direct file upload was the best option for my scenario. Unfortunately this was not clearly documented in the wiki. I have tested and used the following three methods. Method 2. JQuery AJAX Based. Note: This method was done to use on Java 8 on a PC. The method for Android is different and can be found in the api info. Creating a directory is similar to creating a file, the format is called FolderRequest. The difference is, you will be calling a directory in the API call. From the looks of it, this trick may work without specifying the exact folder, etc!!! Same URL format in the above case, the only difference is you can ask Dreamfactory to create a folder and put files into it. First the file to be created must be specified, then the files to place inside the folder. The file API is quite nice and create a layer between the filesystem and our applications. You can easily switch to a cloud based storage or a different network drive without the users noticing it. I came across Dreamfactory while I and a colleague of mine were searching for a REST API for PHP. In summary, this framework simplified a lot of setting up and development time! Specially this is an open source project and has enterprise support. The most valuable feature I saw is ability to connect to almost all major database types and automatically generate the REST API calls. On top of that, this system offers role based authentication and a lot of features. Setting up this framework need some practice and experience with the command line, however following the wiki articles will certainly do the job. Performance : not so much! Depending on the server, the time to process a REST call may take up to a half a second or more. You can try Dreamfactory on their trial accounts or you can clone the Git repo and set it up on a local machine or a hosted server. For a project I’ve been working on, the need came to build the program to run on Windows OS. The project was written in c++ and used OpenCV and Boost libraries. For ease of configuration I employed CMake. Despite the target being Windows, I was developing and testing everything under GNU/Linux 😛 , fortunately I managed to write the code with minimal amount of native unix API calls. For example, file handling was done via Boost Filesystem and so on. Therefore the only consideration was running the CMake script in windows, using Visual Studio or GCC (via MinGW). First attempt was done with VS 2013, but compilation failed with a bug of VS c++ compiler related to c++ template classes and getting a later version was taking time. So I gave a try for gcc on windows! I went for MinGW-w64 (http://mingw-w64.org/doku.php) build since its more accepted and supports 64 bit. (Don’t expect citations justifying this 😀 ). Mingw Builds (http://mingw-w64.org/doku.php/download/mingw-builds) distribution was chosen as I didn’t want to install cygwin or win builds. Its a simple install. The following combination of settings worked for me. Once the installation is complete, navigate to the install location and look for “bin” folder. This is merely used to confirm setting the PATH variable worked. It’ll ask whether it is okay to include CMake binary location to the PATH variable – Tick yes, preferably system wide. Provided everyting works, the output will show the CMake version. I built 3.1.0 with default options. Open CMD and change directory to source folder of opencv. From this step, all commands would be executed through CMD unless otherwise noted. Run CMake. The main change is additional “MinGW Makefiles” parameter. Other than that, this step is pretty much going with standard OpenCV Documentation. Add necessary arguments fitting the needs!. Once Cmake configures successfully, change to the build directory and execute make. Use the multithreaded compile option (-j5) with caution, some laptops tend to go into thermal shutdown with maximum load!! This step will finalize the install. Make sure to download the source package! Note the use of “toolset=gcc”, “-j5” options. These are self explanatory! “–with-<library_name>” flag is used to explicitly include the necessary ones only. If you choose to build all libraries, then don’t specify this at all. cmake -G "MinGW Makefiles" . I mashed up OpenCV and Boost CMake example scripts and some of my experiments to come up with the following CMake script. This script is a bare-bone CMake script, it has to be modified to suite your own project. I’m not an expert in CMake, so there would be room for improvement. I’ve tested the script with following configurations for the same exact project. set(BOOST_ROOT "F:\Program Files\boost_1_61_0") #change this, critical! I came across a few issues while setting up GNU Toolchain on Windows as well as configuring Boost, Opencv. The workaround may clash with existing “make” executable in the PATH. So take care!! Cause : Windows cannot locate the DLL files. Simplest fix is just copying the necessary DLL files and package them when distributing. Warning : Always check legal matters (license agreement) before packing libraries that are not owned by you. Even if the libraries are open source, the license type may restrict distribution in binary format like this. I decided to write this post after experiencing a chain of weird events with setting up CUDA with ubuntu (Kubuntu,etc)! First path is nvidia developer repo. That have own perils but you get latest CUDA version. (7.5). Second path is Ubuntu provided way which is much safer but not the latest (6.5). 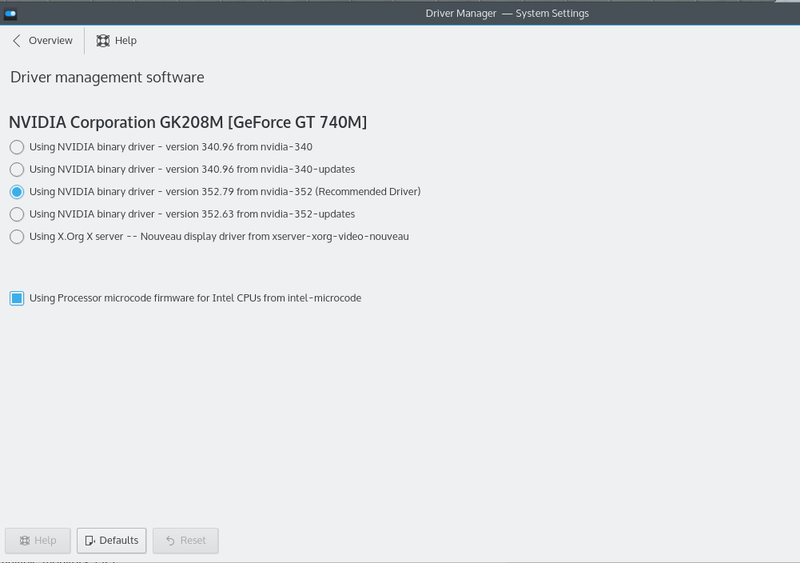 Warning 2: nvidia-prime will set nvidia chipset as the default** This doesn’t work very well and consume power (caused kde to crash with multiple monitors, strange font sizes, etc). Use nvidia-settings and set intel as the primary chipset. Run the following commands, first will stop the DM (sddm for kubuntu, kde dropped KDM since kde 5) second will run gpu-manager that’ll go through the configuration. Observe the output of gpu-manager. Now you can reboot and see the results. Make sure everything works fine (multiple monitors, etc). Install nvidia drivers. Easiest path is using the “driver manager” software of ubuntu/ kubuntu. 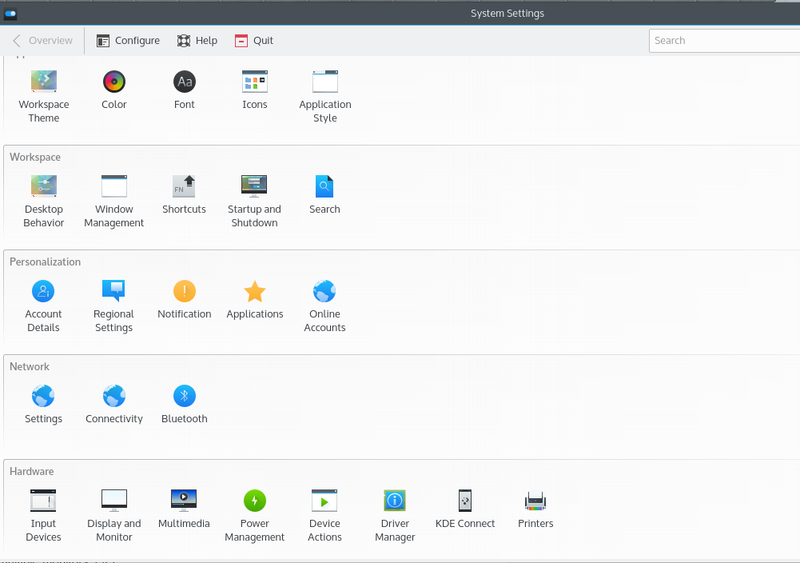 In kubuntu its accessible in System settings. Note “Driver Management” icon in hardware section. Now run “nvcc -V” and see if the compiler runs. I prefer to use cmake script for OpenCV projects so I’ll explain that method. Other options are easily found on internet. If you observe closely, the compatibility matrix shown at nvidia website, maximum supported gcc version at this time is 4.9 with CUDA 7.5 Now the issue is Ubuntu 15.10 have gcc 5+. So the first fix had to be install gcc 4.9 and point nvcc to gcc 4.9. In cMake scripts, the following declarations worked for me. In addition I had to specify some more info. Some people suggest editing nvcc.profile but I didn’t bother, I was already using cmake for the opencv projects! The first two lines found via opencv cmake config and the third had to be added after cmake complained “missing CUDA_CUDART_LIBRARY”. If you get “invalid device ordinal” when running CUDA apps, the reason is the driver seems not to load properly on resuming from sleep. Dmesg will show this as “gpu falling off the bus”. Currently I couldn’t find a fix for the matter, I guess editing the config of nvidia-primus or bumblebee may help. Initially the only solution for graphics switching and keeping the nvidia chipset from overheating or acting strange required some hacking of ACPI calls. Then this project called Bumblebee emerged (http://bumblebee-project.org/). Thanks for the bumblebee daemon, it was possible to have proper power management. Some time later, they released a kernel module called “bbswitch”. This module make life even easier by automatically enabling power management. 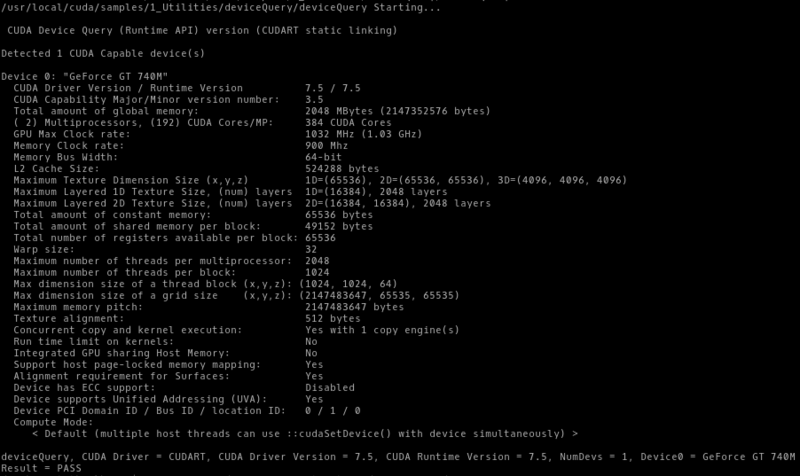 Since the beginning I went with bumblebee + nvidia propriatery drivers, so as usual I went that way with ubuntu. By now, Nvidia has released their version of optimus switching for Linux, the package is known as nvidia-prime. In past, the only alternative was bumblebee. I’m yet to see which works better, but I’m not much concerned as the only use of nvidia in linux is for CUDA based stuff. On windows however, it sees enough action ;).